Module to Prestashop 1.6 and 1.5 It allows you to perform general actions for several orders at once, edit states, download invoices or export the data to a csv. 15/08/2015 - v.1.0 New version. 11/01/2016 - v.1.0.1 Redesign invoice, editing prices. 25/01/2016 - v.1.0.3 Bug prices, add vouchers, translated italian, french and Portugues. 13/10/2016 - v.1.3.6 Add adress,city and phone in invoice. 15/03/2017 - v.2.1.8 Added invoice images.Option to hide order number in multi invoices. 24/03/2017 - v.2.1.9 Fixed error of cron file extension. 29/03/2017 - v.2.2.0 Added country iso code and province in export. 19/04/2017 - v.2.2.1 Field address splitted in address 1 and address 2. 01/06/2017 - v.2.2.2 Added company field to export. 06/06/2017 - v.2.2.3 Fixed errors. 07/06/2017 - v.2.2.4 Fixed errors. 24/07/2017 - v.2.3.0 Added delimitator and decimals to export. 28/07/2017 - v.2.4.0 Added option to show delivery address and invoice address. Translations modified. Speed improvement. 07/11/2018 - v.2.4.6 Added product images in order list. Fixed invoices generation. Testing generation of delivery notes. It allows you to perform general actions for several orders at once, edit states, download invoices, view the contents of the orders or export the data to a csv. One of the most comprehensive to manage bulk orders modules. In case you have problems with a module, 4webs agrees to locate the problem provided it is for reasons attributable to our modules, 4webs not make adjustments for customer need or incompatibilities with other modules. For the purchase of any module is entitled to updates and support via tickets during the first 90 days from the date of purchase, the response time and review of incidents may vary between 24-48 hours. The module updates will appear on your client file where you have enabled the download module or upgrade. The hours of service and customer support on modules are Monday to Friday from 9am to 14pm. If you need urgent interventions or outside of these hours will cost 60 € per hour plus VAT. Once past the 90 days support and updates only those modules that have contracted the corresponding period of support, if you have not hired updates the customer must buy back the module will be given. 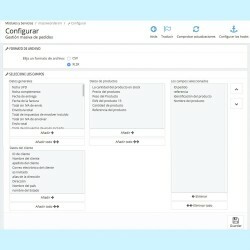 How can support on the modules? For 4webs can locate the problem it is essential to force the compilation and disable the cache. It is recommended to back up all files and database before installing any module. 4webs not responsible for any problems you may have a bad user configuration settings or manipulation of Prestashop hosting.